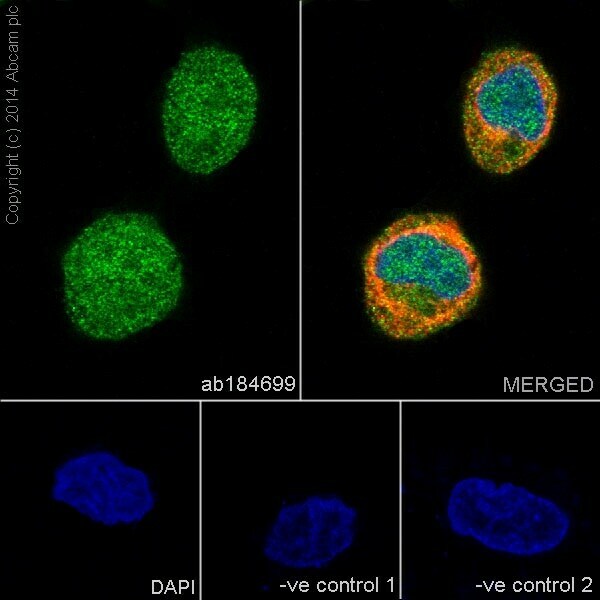 ab218017 is a PBS-only buffer formulated version of ab184699, containing no BSA or sodium azide, ideal for antibody labeling. Please refer to ab184699 for information on protocols. dilutions, and image data. Our Abpromise guarantee covers the use of ab218017 in the following tested applications. WB Use at an assay dependent concentration. Detects a band of approximately 44, 42 kDa (predicted molecular weight: 43, 41 kDa). This data was developed using the same antibody clone in a different buffer formulation containing PBS, BSA, glycerol, and sodium azide (ab184699). 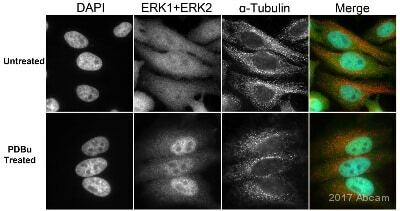 Immunocytochemistry/ Immunofluorescence - Anti-ERK1 + ERK2 antibody [EPR17526] - BSA and Azide free (ab218017)This image is courtesy of an Abreview submitted by Kirk Mcmanus. This ICC/IF data was generated using the same anti-ERK1/2 antibody clone, EPR17526, in a different buffer formulation (cat# ab184699). 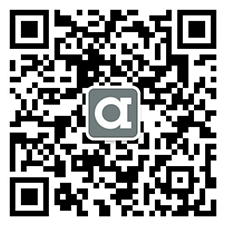 There are currently no Customer reviews or Questions for ab218017.